Start Your Tiny House Research Here! Your question not listed here? It may be answered on our blog. For more information and to get started, get in touch with one of our tiny house experts. What is the price range for your tiny houses on wheels? The starting price for our complete, turnkey tiny houses on wheels ranges between $39,000 and $89,000. For current product pricing, visit our online catalog. 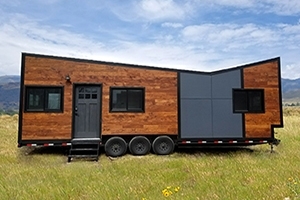 Financing is available for B&B’s RVIA-certified tiny houses on wheels. 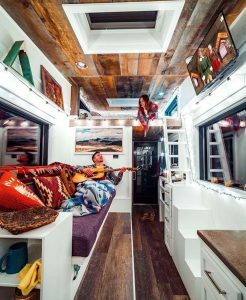 Do you offer tiny house tours? We offer private tours to serious tiny house buyers by appointment only at our workshop in North Adams, MA, on weekdays when we have units in stock; after you’ve chosen your tiny house model, please call (530)686-5680 or email info@bbtinyhouses.com to make an appointment. It is a working space, so please wear proper footwear and watch your step and the movement around you. Those touring our space enter the property at their own risk. We are also happy to give video tours through Skype or Zoom to serious buyers. For those who are “just looking”, we love to show our houses to you too! We periodically exhibit our houses at tiny house shows and other events, usually during the summer and fall: please check our blog for our next tiny house show. What’s the tiny house buying process like? Click here for an overview of the 8 Steps of the Tiny House Buying Process. Can you tweak your tiny house designs to my taste, or design/build a custom tiny house for me? Our tiny house catalogue includes many different floor plans for different lifestyles. These houses can be customized to the buyer’s specifications. Customizations include your choice of materials, fixtures, and finishes and do not include changes to the blueprints of the tiny house. When you’re happy with your estimate, contact us to schedule a preliminary design session. We also design entirely original custom tiny houses if you’re ordering three or more of the same tiny house. Please visit this page for details. How big can a tiny house on wheels be? In order to be road-legal, our tiny houses on wheels are a maximum of 8 1/2′ wide. We also offer extra-wide Park Model Tiny Houses (for example, the Kinderhook and the Taconic); these houses must be moved with permits, so they’re not meant for frequent travel after they’re professionally delivered to your site. The length of our houses ranges from 16′ to 32′. (If you’ll be towing your own tiny house, we recommend one under 24′ in length). Tiny houses on wheels have to be able to fit under bridges when they’re traveling on the road– our tiny houses have a maximum height of 13 1/2′. 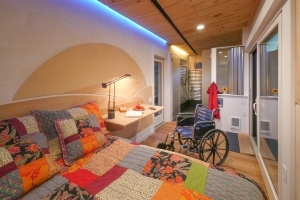 Can you build ADA-compliant or otherwise accessible tiny houses? Absolutely! We have built several tiny houses that are ADA-compliant. Please get in touch with us about your accessibility requirements and we’ll be happy to make one of our tiny house designs accessible for you. We also are happy to announce we are now the builder for Wheel Pad, a universally accessible addition. Wheel Pads are great for those wanting to live with family but retain independence in their own accessible living space. Learn more on our Wheel Pad page. Can I power my tiny house with solar energy? The lowest-cost energy solution for tiny houses is plugging into an existing energy source, but for our customers who require an off-grid-lifestyle or supplemental solar energy, we recommend using Alt-E Store, a Massachusetts-based alternative energy system supplier. Tiny house solar energy systems can cost anywhere between $3,500 and $50,000, depending on your appliance usage. The amount of power you’ll need in your tiny house is less dependent upon the square footage of your house and more dependent upon the efficiency of your energy usage. Appliances like washer/dryers, refrigerators, and heaters dramatically increase energy consumption; if you’ll be off-grid, we recommend cutting down on your energy usage and using as many appliances as possible with alternative sources of energy such as propane. If you’ll be grid-tied, you can power more appliances. You’ll sell energy to the grid when you’re not using appliances and use energy from your solar panels and the grid when you are. You can find out more about Alt-E Store’s recommendations for tiny house solar energy here. Plug your energy requirements into their load calculator to get an estimate of the amount of power you’ll need in your tiny house and what your solar requirements will cost. How long does a tiny house take to build? After the final design is reviewed with the customer, the contract is signed, the deposit has been received, materials arrive and the house enters our production line, our tiny houses will typically be ready for delivery within 3 months. Our production schedule varies throughout the year: if you need a tiny house ASAP, please let us know as early as you can that you’d like to reserve a spot for your tiny house project. Our 35 employees, with a combined experience in the construction field of 471 years, build six houses at a time. Where can I legally park a tiny house? Do you offer help with zoning? Laws vary town by town, zone by zone. Please check in with your local planning board. A blog post on what to know before buying land for your tiny house, and how to speak with your planning board is here. 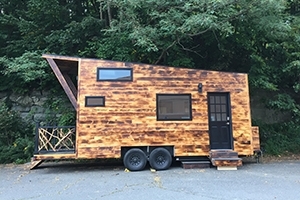 Try It Tiny is a great resource for long term and short term parking rentals, and the American Tiny House Association website lists regional zoning laws and building codes regarding tiny houses on wheels and on foundations as well as information on how to approach your planning board to ask for permission to use your tiny house as a residence. Our complete, turnkey tiny houses on wheels are registered by the RVIA, so they are legally considered RVs. They can be parked anywhere an RV can be parked. We offer services assisting with zoning and planning for multiple-house projects, like developments, campgrounds and hotels. Contact us for more information regarding multiple-house projects. Yes! 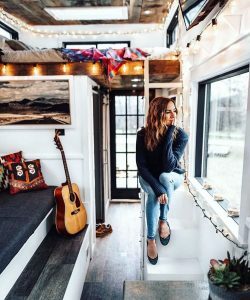 Buyers of RVIA-certified tiny houses on wheels have three options for financing: Adams Community Bank for tiny house financing within Berkshire County, Lightstream for an RV loan anywhere in the US, or seeking an RV or Personal Loan through your own bank. More info is on our Tiny House Financing page. Please contact us for more information on tiny house financing. DIY tiny house shells and frames cannot be RVIA-certified because they are not finished in our shop, so they cannot be financed with a Tiny House or RV loan, but can be financed with a personal loan. What’s the difference between Tiny Houses on Wheels and Modular Homes? Tiny houses on wheels are permanently on the chassis. The wheels can be removed but the house will always be on the trailer. If you want a tiny house on wheels but don’t plan to travel with it, we can also permanently anchor a tiny house on wheels to the ground, remove its tires, and skirt it. Road-legal limits of 8 1/2′ wide and 13 1/2′ high constrain the size of tiny houses on wheels. We are certified to build tiny houses on wheels by the RVIA, so our tiny houses on wheels are legally considered RVs. Tiny houses on wheels don’t require a building permit, but you’ll need to make sure RVs are allowed in your zone of your town. Modular homes (coming soon from B&B!) look just like traditional houses, and can be any shape and size. After they are built and inspected inside our factory, they are transported to their site and then permanently attached to the ground where they are inspected again. Modular houses, if they are large enough, are built in sections. B&B Micro Manufacturing is certified to build Industrialized/Modular Homes by the State of Massachusetts. Modular homes are financed using traditional home financing. Both types of homes are built inside our factory in Massachusetts. Are your tiny houses on wheels certified? Yes! Our turnkey movable tiny houses are certified by the Recreational Vehicle Industry Association, through a series of inspections on every aspect of the build process. 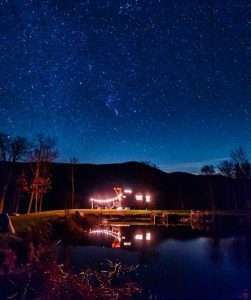 B&B Micro Manufacturing is the only RVIA-certified tiny house builder in the Northeastern United States. Are your tiny houses on wheels warrantied? Yes! Read below for our warranty. B&B has supplied the Buyer with this Limited Warranty prior to the Effective Date. B&B warrants the tiny home for one (1) year from the Delivery Date against (i) material defects in material and workmanship; (ii) system and mechanical defects; and (iii) structural integrity failures. Repair of these items of defect at B&B’s expense are the Buyer’s sole and exclusive remedy under this Limited Warranty. This Limited Warranty does not apply to any product failure or defects arising from (i) damage caused by abuse, misuse, neglect, failure to provide maintenance as directed by B&B; (ii) normal wear and tear, deterioration, warpage or shrinkage within industry standards; (iii) changes due to weather conditions, soil movement or fire or other casualties; (iv) damage caused by Buyer or third parties performing work on the tiny home; (v) or related to nonperformance of appliances or equipment covered by manufacturers’ warranties; or (vi) transporting or relocation of the tiny home after delivery. ANY ADDITIONS, UPGRADES AND MODIFICATIONS MADE TO THE BASE MODEL OF THE TINY HOME ARE NOT COVERED BY THIS LIMITED WARRANTY UNLESS OTHERWISE NOTED, INCLUDING BUT NOT LIMITED TO THOSE ADDITIONS, UPGRADES AND MODIFICATIONS IDENTIFIED IN THE BUILDING PLANS OR THOSE IDENTIFIED IN ANY CHANGE ORDER BETWEEN B&B AND BUYER. BUYER UNDERSTANDS THAT DEVIATIONS FROM B&B’S PREFERRED MATERIALS IN THE BASE MODEL ARE TAKEN AT BUYER’S OWN RISK. DISCLAIMER AND LIMITATION OF LIABILITY. THE WARRANTIES SET FORTH IN B&B’S LIMITED WARRANTY ARE EXCLUSIVE AND NO OTHER EXPRESS WARRANTIES ARE MADE BY B&B OR ARE AUTHORIZED TO BE MADE WITH RESPECT TO THE TINY HOME. IN NO EVENT WILL B&B BE LIABLE FOR INCIDENTAL OR CONSEQUENTIAL DAMAGES OF ANY NATURE WHATSOEVER, INCLUDING, BUT NOT LIMITED TO LOST PROFITS, OR COMMERCIAL LOSS ARISING FROM USE OR FAILURE OF B&B’S PRODUCTS, TO THE FULL EXTENT THAT SUCH DAMAGES CAN BE DISCLAIMED UNDER APPLICABLE LAW. THE REMEDIES PROVIDED UNDER THIS LIMITED WARRANTY ARE EXCLUSIVE. Can you deliver a tiny house? Yes, we deliver tiny houses anywhere in the contiguous United States. Contact us with your site’s zip code for a delivery estimate and for sales tax information on out-of-state tiny house RV purchases. If your tiny house is oversize (10′ wide rather than the standard 8 1/2′ wide), we can still deliver it in the northeast. Delivery prices will be higher as we need to procure an oversize permit for every state it travels to. Do you offer site work? Yes! If your property is within a reasonable distance to our workshop in North Adams, MA, our site work division can help! To provide you with an accurate estimate, we will speak with you and then visit your property to determine your needs for freshwater, waste water, power, and whether the tiny house will need to be on a slab or gravel pad. We don’t ship overseas, but we can deliver a tiny house on wheels to the nearest border. The buyer is responsible for arranging for the rest of the tiny house’s journey. Photos of The Arcadia by Kyle Finn Dempsey & Leah Mae.